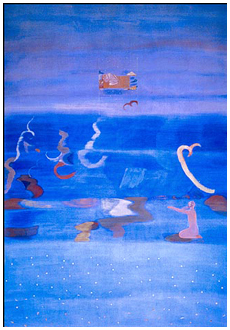 Nilima Sheikh is an Indian artist with a distinguished local and international career. Much of her work refers to a range of traditions that act as both a source of inspiration and a framework within which she explores her own contemporary vision. These include historical schools of Indian painting, such as the Bengal School of the 1920s (which developed a national style of painting in opposition to a western academic style), the Pahari miniature tradition (the eighteenth- and nineteenth-century miniature schools of the north Indian hill country), the Chinese paintings of Dun Huang and the paintings of the Italian Renaissance. 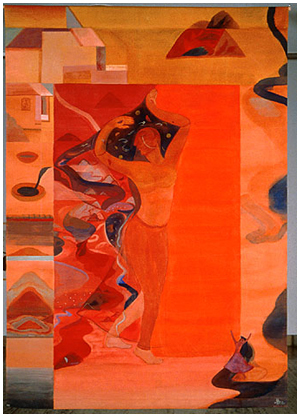 Nilima Sheikh currently lives and works in Baroda, India. The primed calico cloth is painted to saturation point with casein tempera. This is made using curdled milk-glue to apply earth and mineral powders, such as terra-verte, ochre, burnt-sienna and mercury-vermilion. Sheikh applies this background colour with broad horizontal brushstrokes. In order to paint detailed imagery, the artist uses extremely thin, squirrel-hair brushes. These curved brushes allow the artist to paint lines of varying width.